Click here for an overview of my Professional Experience. A native New Yorker (upstate), I grew up in Northern Ohio near Pennsylvania. I was always enchanted by story and spent many long hours immersed in books. As a child, my other love was wandering and wondering out in the woods behind our family home. In 1992, I was reading folktale picture books to my 4 yr old and enjoying her experience of them, as well as remembering my own childhood delight in them. The Grimm’s collection of tales had been a powerful, metaphorical presence in my youth. It was also during this time in my life that I was working with Jungian archetypes, exploring dream images, studying history, and steeping myself in the works of thought-leaders like Barbara Walker, Riane Eisler, and Joseph Campbell. I suddenly realized that these folktales were a powerful resource and began to appreciate how archetypal they were. Story transmits deep wisdom and insight through its imagery. The archetypes in the story are a part of the collective unconscious of all of humanity and have relevance to each one of us, however, what stands out at any given time is a communication from your own personal unconscious mind. I realized then that this was the most exciting work I had ever discovered. 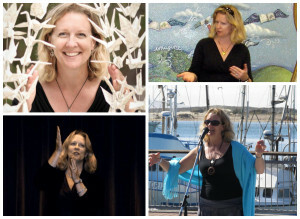 Although I had never heard of a profession called ‘Storyteller’, I began to perform stories, and developed workshops such as Story Wisdom, Uncovering Your Personal Mythology, and The Listening Circle. Over the past two decades, I’ve performed, recorded, written about, and worked through, Story, with all ages and in every type of venue you can imagine. During a storytelling, the listeners and I enter a world, as if for the first time. I am the guide, and like any adventure, sometimes unexpected things happen. For many people, it is the first time they’ve experienced story with a traditional storyteller. One of the most exciting aspects for me is sharing in listeners’ discovery of how powerful story is for them. I have come to understand that the most important key to story and storytelling is Listening. Not just to the voice of the teller, but even more to the voice within ourselves that is speaking to us through the story. Story allows us to listen to our hearts through our minds. The most important story is the one we have about ourselves, the next is the story we have about the world, and the third is the story we have about our place in it. I live in California, in a quiet little town on the coast. A lifelong, self-directed learner, I am a certified life coach and Master Practitioner of the Energy Leadership Index Assessment. I’ve also completed 2 years of Self-Leadership training with an IPEC Energy Leadership coach and the Caring Economy Leadership Program through the Center for Partnership Studies. I share story where ever invited, produce storytelling events, lead workshops, write a weekly column, and blog. I am always seeking new stories and new ways to cultivate my story garden. Creating the Peace Love Story Fest and facilitating over 200 community members folding over 1000 origami cranes in honor of the International Day of Peace in 2012. SMARTS program of the San Luis Obispo County Arts Council – working with at-risk high school students and discovering how creative and artistically talented they all were. My philosophy is that storytelling is an essential ingredient for creating empowering responses. Story offers images and words to describe the challenges, the joys, the losses, and, the beauty in life. Connecting to and through Story strengthens our ability to meet and respond to the demands of our world. The story we hold about ourselves, our world and our place in it drives our thoughts, feelings, and choices every day.